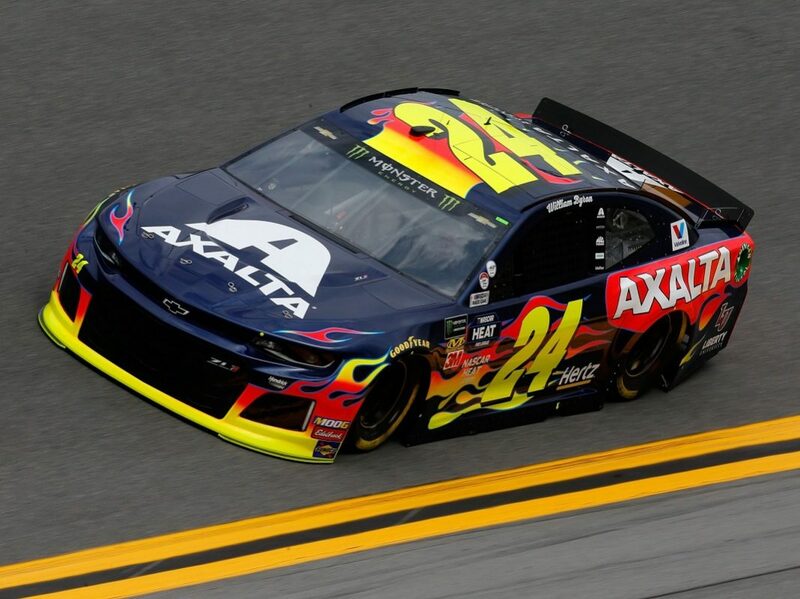 DAYTONA BEACH, Fla. – Making just his 37th career Monster Energy NASCAR Cup Series start, William Byron laid down a career highlight during qualifying for the 61st annual Daytona 500 on Sunday. Byron rocketed to his first-ever pole at NASCAR’s top level, touring the 2.5-mile Daytona Int’l Speedway in 46.319 seconds (194.305 mph) to place the No. 24 Axalta Chevrolet Camaro ZL1 on point for next weekend’s running of The Great American Race. It was part of a sweep of the front four positions by Hendrick Motorsports in two-lap time trials for NASCAR’s biggest event, but the star of the show was a 21-year-old from Charlotte, N.C., who just finished his first full year in the Cup Series last fall at Homestead-Miami (Fla.) Speedway. Byron became the second-youngest pole winner in Daytona 500 history on Sunday, just behind his teammate Chase Elliott, who was 20 years, two months and 17 days old when he earned the pole for the season opener in 2016. Despite his stellar lap, Byron actually felt that he could have gone even faster in the final round. “We lacked a little bit getting up to speed; I think there was just a little too much wheel-spin,” noted Byron. “This thing’s fast, though. I’m really looking forward to next Sunday. Byron’s teammate, Alex Bowman laid down the fastest lap in the first round at 46.408 seconds (193.932 mph), but couldn’t quite pick up enough speed to edge out Byron when it came down to crunch time. Bowman still secured a front-row starting spot, however, qualifying second-quick with a time of 46.355 seconds (194.154 mph) in the No. 88 Nationwide Insurance Chevrolet. “William picked up like a half-and-a-tenth there, so he must have gotten a little gust of wind or something,” Byron noted. “I’m just really proud of everyone at Hendrick Motorsports. To be 1-2-3-4 is really cool. Mr. H is here – he missed last year, so this is really neat. Jimmie Johnson and Chase Elliott filled out the Hendrick quartet, qualifying third and fourth, respectively. 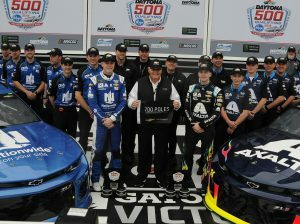 For team owner Rick Hendrick, Sunday marked his record-extending 13th Daytona 500 pole and his fifth in a row. He expressed disbelief in the moments immediately after qualifying at the strength of all four of his race cars, as well as pride in the performance of his team’s youngest driver. Kyle Busch was the first driver who failed to advance to the final round of knockout qualifying, bumped out by his teammate Truex at the final moment in round one. Busch ended up 13th on the scoring pylon with a time of 47.080 seconds (191.164 mph) in his No. 18 M&Ms Chocolate Bar Toyota. Other notables who missed the top 12 in single-car runs included 2007 Daytona 500 winner Kevin Harvick (15th), 2017 winner Kurt Busch (21st) and 2008 winner Ryan Newman (24th). The two Open drivers who locked themselves in on speed were rookie Tyler Reddick and Casey Mears. For complete qualifying results, advance to the next page.